WOLVES CAN Sing Community Choir will be holding a Charity Fundraising Event for POWER PLEAS this Sunday, 2nd July 2017, at the Christian Life Centre, Sedgley Street, Wolverhampton, WV2 3AJ. The performance will start at 4pm and finish around 5:30pm. Entry is £3 with under 5s free – everyone is welcome. POWER PLEAS Chairman Keith Berry will be on hand to give a short talk about the charity, so please bring your family along for a fun afternoon of music, poetry, dance, food and drink! WOLVES CAN Sing is a combined adults and children’s choir and consists of people from all walks of life. 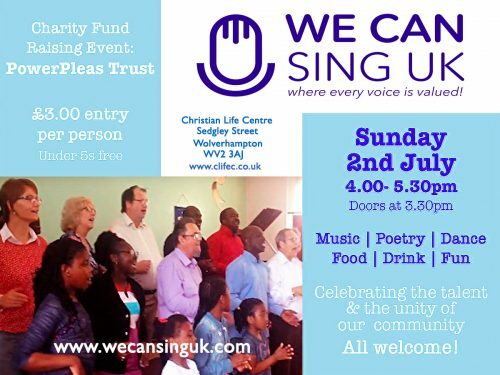 To reserve tickets you can email Alanna@wecansinguk.com, or just turn up on the day. For further information see the WOLVES CAN Sing web page, or visit WE CAN Sing UK on Facebook.